Since its beginning on March 20, 2012, My Neighbor in Need has grown from one “Good Deed Doer” to a Montana Nonprofit Corporation with 501(c)3 approval and thousands of Good Deed Doers, like you! The Board of Directors currently has 6 members and the organization has 5 full-time staff members including the Executive Director and 2 part-time staff members. My Neighbor in Need and My Student in Need are brought to communities by countless caring and devoted individuals. As of June 2016, the My Neighbor in Need website has fulfilled over 7,000 need requests and My Student in Need has fulfilled over 1,500 requests. Those fulfillments have included everything from a warm winter coat, bedding, a bed to sleep on or a couch for a neighbor’s living room. Donors have helped their Neighbor’s in Need with car repairs, utility bills, transit bus passes and bicycles to get to and from work. For Student’s in need, donors have provided clothing, shoes, instrument rentals, binders, backpacks and so much more to students all across the state. It’s all been done anonymously with no embarrassment to the individual in need. My Neighbor in Need and My Student in Need truly represent the good in the communities we serve, because without the support of the community, we could not continue to broker goodwill and give hope to the hopeless. 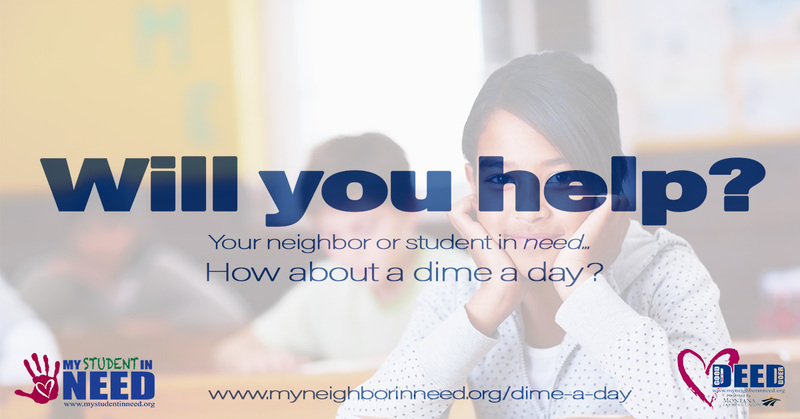 A Dime a Day is a month long campaign when we ask the community to come together and simply pledge a “Dime-a-Day” for one year. That equals a one-time donation of $36.50. How Does a Dime a Day Make a Difference? Ten cents a day may seem too small to make a difference, but when the community comes together for this once-a-year ask, the results are amazing. In just over four years, My Neighbor in Need and My Student in Need have fulfilled over 8,500 need requests through the generosity of the community. Operational costs are provided by a generous partnership through Montana Farmers Union, many local businesses we call “Partners in Dignity” and through community support. My Neighbor in Need is a tax exempt, 501c3 organization. Donations can be made in person, by mail, or on-line using the form on this page. The Board President and Founder of My Neighbor in Need and My Student in Need, Dave Snuggs, believes that brokering goodwill and giving hope to the hopeless is what community is all about!